Indian Motorcycle officially launch the new model Scout FTR750 in the 76th annual Sturgis Motorcycle Rally event. This flat tracker type motorcycle will also mark the return of the Indian Motorcycle to the AMA Pro Springfield Mile racing event in Illinois. To mark the launch of the Scout FTR750, the company invite two flat tracker legends, ie Bobby Hill and Bill Tuman. Both are members of the AMA Hall of Fame who used to take part with the Indian Motorcycle. 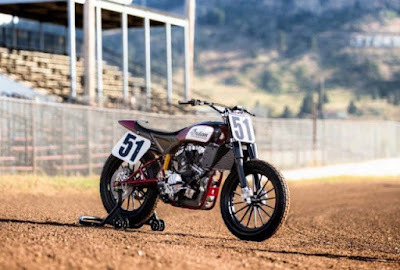 "A heritage of racing and winning is in the lifeblood of this brand, and everyone in attendance was clearly proud to be a part of this important moment in the historic return of Indian Motorcycle to professional flat track racing," said President of Motorcycles Steve Menneto. 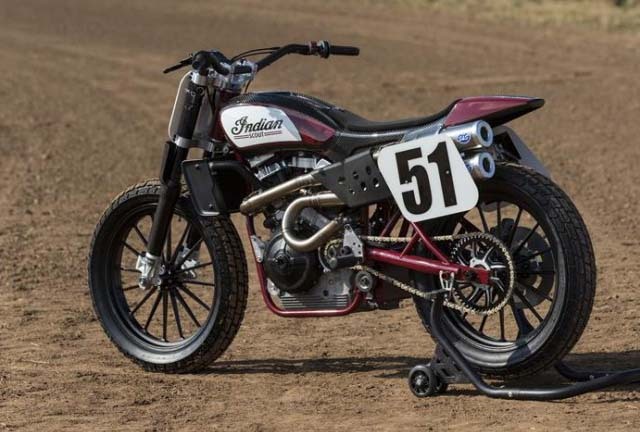 Indian Motorcycle has not revealed detailed specifications of its Scout FTR750. But note this bike brings 750 cc v-twin engine, tubular steel frame, and fully carbon fiber body to cut the weight. Indians Motorcycle also have not said whether the motorcycle will be sold to the public or only for racing purposes. Certainly, Indian Scout FTR750 going to be a strong competitor of Harley-Davidson XG750R are also new for release some time ago.